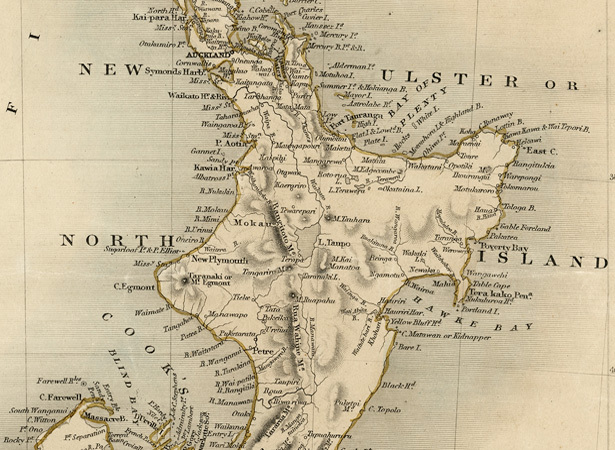 New Zealand officially became a separate colony of the United Kingdom, severing its link to New South Wales. North, South and Stewart islands were to be known respectively as the provinces of New Ulster, New Munster and New Leinster. William Hobson had been appointed Britain’s consul to New Zealand in 1839. He was instructed to obtain sovereignty over all or part of New Zealand with the consent of ‘a sufficient number’ of chiefs. New Zealand would then come under the authority of George Gipps, the governor of New South Wales; Hobson would become Gipps’ lieutenant-governor. On 21 May 1840 William Hobson proclaimed British sovereignty over all of New Zealand, the North Island on the basis of cession through the Treaty of Waitangi and the southern islands by ‘right of discovery’. Signatures to the Treaty were still being sought. Hobson may have wanted to declare the Crown’s authority over the whole country because he had learned that the New Zealand Company had plans to set up its own administration around Cook Strait. Shortly before Hobson left Sydney in January 1840, Gipps had issued a proclamation extending the boundaries of New South Wales to include such territory in New Zealand as might be acquired in sovereignty. The Legislative Council of New South Wales passed an Act extending to New Zealand the laws of New South Wales on 16 June 1840 and established customs duties and courts of justice here. The relationship with New South Wales was intended to last only while British sovereignty over New Zealand was being asserted. Even before Hobson’s dispatch reporting his proclamations had reached London, his political masters had decided to make New Zealand a separate colony. The ‘Charter for erecting the Colony of New Zealand’, effective from 16 November 1840, also constituted a nominated Legislative Council. The provincial divisions were at first of geographical significance only. They were not used as a basis for the government of the colony, which was centralised in Auckland. In 1846 a further Royal Charter divided the colony into two provinces and provided each with its own political institutions in addition to those of the central government. The two provinces were called New Ulster and New Munster. New Leinster was merged with the South Island and the southern portion of the North Island as far north as the mouth of the Pātea River in a reformed New Munster. Each province was to have a governor and a Legislative and Executive Council, with a governor-in-chief and his Legislative and Executive Council providing the central authority. In 1851 the provincial Legislative Councils were permitted to be partially elective. This system was rendered obsolete by the passage in Britain of the New Zealand Constitution Act 1852. We have 2 biographies, 3 articles, related to New Zealand officially becomes British colony .